This past weekend I opened up a couple bottles of French white wine. I thought they would pair well with a dinner I was making and I was right. While it’s true that I much prefer red wines to white I have been trying to expand my palate to include interesting and unusual wines. I am getting tired of the usual California white wines. Never been a CA chardonnay drinker. I enjoy New Zealand sauvignon blanc now and then, but even that is getting old now. 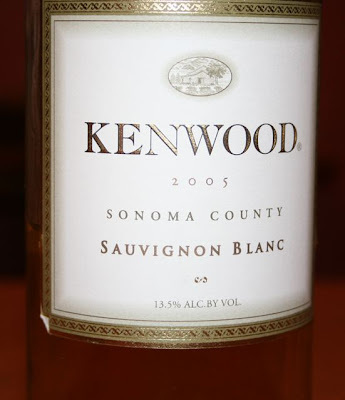 I want to find more refined, more complex, less sweet and less acidic whites to go with food. 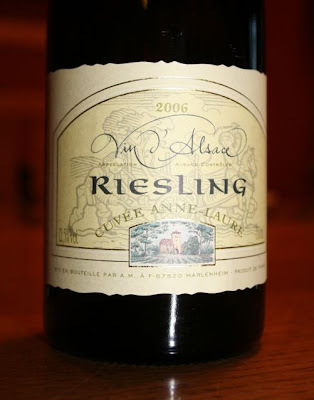 I love Alsatian rieslings. Mostly for the fact that they pack unbelievably complex flavor in a nice dry white wine. I much prefer this style to sweeter style whites. The best one I can find locally is produced by Arthur Metz and comes under the label of Cuvée Anne-Laure. 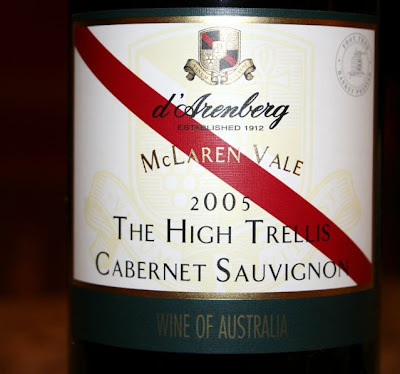 I have had previous vintages and found them full of interesting flowers and fruit. 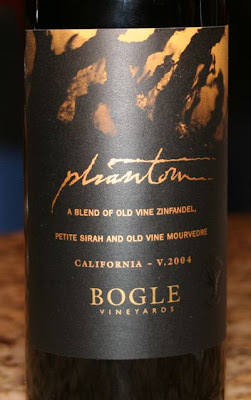 This was the first 2006 that I have tried. It was certainly different than previous vintages in that the floral notes were less apparent (though there) and honey predominated on the nose and on the palate. I could detect aromas of melons and, believe it or not, juicyfruit gum along with the honey. It wasn’t sweet at all which I liked very much. I served this with some ham wrapped melon balls and it paired very nicely. I would say I was a little disappointed in the way the honey overpowered and I think I prefer the 2005 over the 2006. Never the less it is a solid effort from Asace. Ah, Chateauneuf du Pape! I adore Rhone wines. 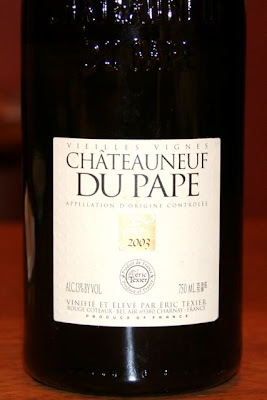 I had a bottle of the 2003 Eric Texier Chateauneuf du Pape blanc about a year ago and I have very fond memories of it. A gorgeous dry fruity Rhone white that was extremely food friendly. When I made a chicken and cheese soufflé on Sunday this is the wine I had in mind. Unfortunately my expectations fell short when I found the bottle was flawed. I had a feeling when I pulled the cork that it would not be ideal. The cork was brittle and you could tell that the wine had seeped all the way to the end. Not a good sign. The bottle wasn’t ruined but it was certainly off. 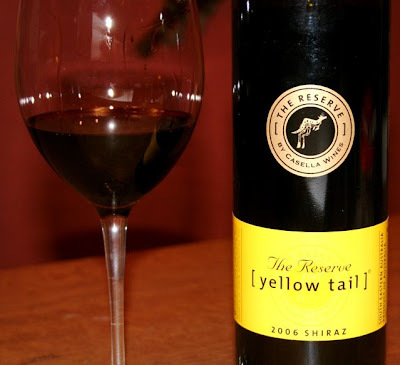 It had a slightly floral nose with eucalyptus aromas. I could also smell ethyl acetate indicating that there was something amiss. The wine did have some very nice flavors of pears and dried apricots that were unfortunately covered up by a bitter off taste that I would compare to a saccharin aftertaste. So, this one was a miss. I know this is usually a solid solid white wine and will definitely seek it out again. I was looking in my cellar for something that would go well with roasted chicken. 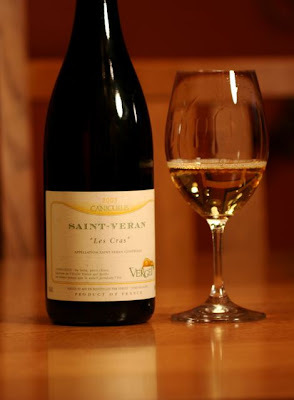 So I pulled out this bottle of the 2003 Verget Les Cras Caniculus from the Saint Veran region of Burgundy. Another French delight for me. I am not really much of a chardonnay drinker. I think that is because my palate has been spoiled over the years by over oaked unbalanced California chardonnays. This, on the other hand, puts all of California to shame. It had a beautiful light golden color. On the nose it presented solid apple pie and pears with some hints of minerals sort of like stones. There was also just the tiniest hint of lightly toasted oak. 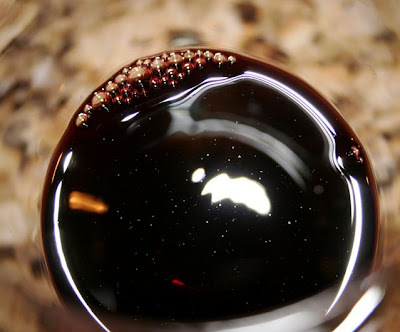 The same was observed on the palate. 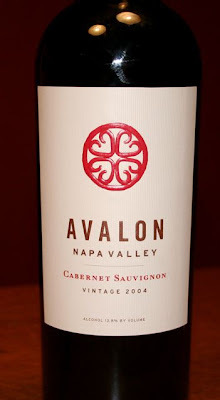 It was supple and silky in texture and there was a very nice crescendo of tons of fruit that lingered for quite a long time. I detected just a tiny hint of cinnamon and nutmeg on the back of the roof of my mouth. It had a really nice balanced acidity. I think this is a great effort in a white wine. I definitely need to try more white burgundies. This paired brilliantly with a roasted chicken dinner. You may have noticed that my posting has slowed down just a little bit lately. After the over excesses of the holidays I’ve had to cut down on my calories and alcohol. So, I’ve been saving the wine for the weekends. Earlier this week a case of 2005 Bordeaux arrived from Wine Library. I have been dying to taste this all week. I am beginning to really appreciate the old world style wines from Bordeaux and am learning a lot as I taste more and more. 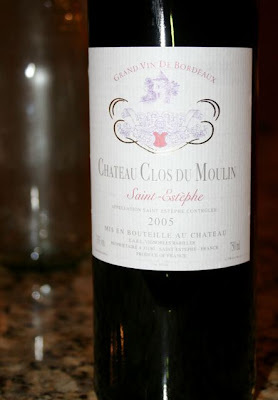 The 2005 Chateau Clos du Moulin comes from the St. Estèphe commune at the northernmost part of Médoc. Wines from this region are typically tannic and slower maturing than other areas of Bordeaux. According to Robert Joseph (French Wines The essential guide to the wines and wine-growing regions of France, DK Publishing) when the classification of vineyards in Bordeaux was happening in 1855 the wines from this region were considered to be of lesser quality than other areas of Médoc. Thus, it was only awarded 5 crus classés. Forty vineyards were deemed to be crus bourgeois. I never realized that the classes were designated more than 150 years ago. See, I’m learning! I think a lot can change in 150 years and now I wonder how much stake to put in the vineyard classifications of France. I would welcome comments and discussion about this point. Anyway, I digress. St. Estèphe has a soil that is a mix of gravel and clay. This is a combination that can make Cabernet Sauvignon rather rough. Thus more merlot was planted in this area in the late 1980’s and the wines have become softer and more supple than before. The 2005 Chateau Clos du Moulin is comprised of 40% merlot, 40% cabernet sauvignon and 20% cabernet franc and petit verdot. I found it to be a super interesting wine and one that a novice like I could guarantee will age nicely for at least the next 10 years. When I first opened the bottle the nose was a bit closed. After a few minutes and warming the glass with my hands I began to notice aromas of cherries and some spice, maybe anise. Interestingly I noted the tiniest hint of caramel on the nose. Drinking this was an experience, I tell you. At first I was attacked by alcohol. My first tasting of this right after opening made me think this was out of balance. The alcohol level is 13%, by the way. But the more I tasted it and the more it aired out and opened up, the more excited I got about this wine. It had quite firm tannins that probably exaggerated the alcohol at first. But I also tasted lots of long lingering fruits. They were a mix of black currant, blueberry and cherry. There was a distinct minerality on the palate as well mixing with an earthy moss flavor. Some spice perked up the flavor and just on the very back sides of my tongue I could detect what to me tasted like rollo candy. You know those candies with creamy caramel in the center covered in chocolate. It was definitely the caramel chocolate combination, not one or the other alone. It had a long finish and pleasant aftertaste. All in all this was a solid bottle of Bordeaux for under $20. If I were to drink it now I’d definitely decant it for at least a couple of hours. Better yet, leave this one in the cellar for a few years and I think you will be rewarded with a beautiful, balanced, and supple wine.